Square Toe Cowboy Boots: Feel the Historical Fashion Statement-- A square toe Cowboy Boot is generally a True fashion statement. This old and young trendy boots take us to the traditional world rushed towards the popularity over the past few years. It is a great substitute for most of our conventional styles. The square toe boots has mounted in esteem and is turned into a fresh take-off for the traditional style of approach which dignifies the historical fashion statement. This style is really a keystone for individual approach towards fashion. It is more versatile because you'll see it either on riding or on working and on fashion season too. Many cowboy boot wearers want to explicitly show that they are updated and fashionable to this day. Olden days of Square Toe Boots: No one knows and there's no proof for the true history of how the square toe cowboy boots was invented and came into practice. There was not really a single man who can claim the real credit for inventing the square toe boots. Its production just began as a practical instrument for the cowboy's foot wear, which majorly protects them from various hurdles and as time goes on it has changed into an essential tool of their daily life. But almost immediately it became a fashion statement. Various modern Square Toe cowboy boots comes in several different colors and styles. Usually the stitching on the outsole were done either in a plain black or brown leather but lately it gave way to more colorful yarns and designs and some ornamental pictures were sewn into the boots. From there, cobblers began to experiment with hatches and overlays and at some extent the design of boots became rapidly infinite. 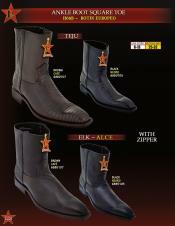 Nowadays complex stitching and the designing completely involved in differentiating the various cowboy boot makers. Various Forms of Square Toe: During Cowboy days riding horses was the main form of transportation and hence enclosing a sturdy pair of riding boots were became mandatory. Some of the square toe boots made explicitly for horseback riders and so it is made with a cut at the back of insole. To trigger the needs of soldiers, military cowboy boots were created by different military supplying factories. These boots were changed with each culture gradually, as they had exceptional styles as well. Often some countries took certain specific styles to make their own trademark boots to match their culture's style at that time. Of these various styles the final and general style of western boot toes is the "square toe" which is obviously the real form of fashionable manifestation. Superlative Words for Square toe: In western countries, Square toe is the only style that men and woman will choose often. If you roam over Texas or Kentucky you will find most frequently the people with this type of square toed boots. I personally love and recommend the way they look with a worn out pair of boot cut jeans. Many of the girls wear this square toed boots and it really looks cute and stylish. It is a kind of affix for a sturdy outlook in the country outfit. 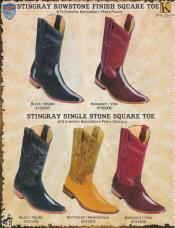 Square toe's are not only for the stylish cowgirls but they are also a smart collection for men. In fact it'll be more appropriate for mens of all ages. This styled boots greatly speaks while working in the dirt, on a farm. 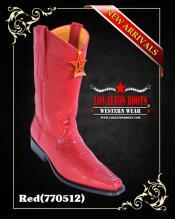 They are almost perfect for western riding and will be pleasing when paired with appropriate outfit. It should be worn with right attitude and strongly I would say that this is a more rugged look when anyone opt it off for more traditional attire. Some people will feel more comfortable because it sum up a little more extra width than the normal boot and making an allowance for such a toe boot which provides little bit wider than usual. Design Analysis: These cowboy boots are the stylish alternative when compared to the average round or pointed toe cowboy boots. The design of square toe boot should have the sole to be thick enough to guard the foot from the rocky landscapes. Heels must be higher than the bottom surface, so that you can comfortably place them in the stirrups without slipping them out. A nice quality of square toe cowboy boot seems to be more comfortable and a little roomier inside the toe area. But in pointed toe boots, when pulling it out you can often feel the difficulties and sometimes it will be more painful for your wider foot. This moderately reduced the usage of pointed toe significantly less often than not like opting a square toed boots. An Alternative: The wide square toe is another option when searching for a square toe cowboy boots. It gives a more casual look than the normal square toe, but it can still remains formal with darker shades like immersive collaborations with Tan-Beige-khakis. There is no doubt that the fashion cycle become more flattened and yet we believe, this is a major shift and this square toe will be the leading toe for every men's boots need for the next few decades. Whether you're looking for traditional cowboy boots for casual attire or for a professional wear or if you have to opt little bit striking or want to feel wildly colored for a night out, you must try on surfing the internet for square toe cowboy boots. Usually you can find keyword square toe cowboy boots at MensUSA for a bulk amount noticeably less than you would search in other stores. One important thing should be kept in mind while purchasing for square toe cowboy boots is that you need find square toe variations among the square toed boot design.Nearly all boots appear practically like pointed toe western boots except with the fairly tip cut square, while a couple of boots have a completely blunt square toe design. In our custom cowboy boot collection we've made it with various combinations of 4 heel choices, 7 toe shapes, 4 top edge scallops, 9 types of stitches and 4 different types of pulls. Make sure to opt the perfect square toe before purchasing.